My hummingbirds bid me farewell this week after “one for the road” at the turk’s cap inn. I expect butterflies to drop in any day now. 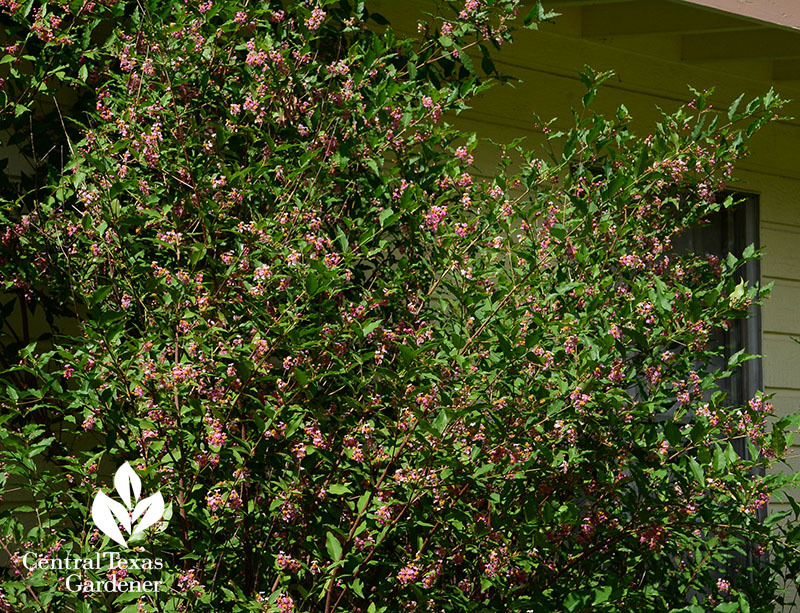 As usual, when native Barbados cherry (Malpighia glabra) burst into its second major bloom (the first in late spring), bees wasted no time getting to the feast. 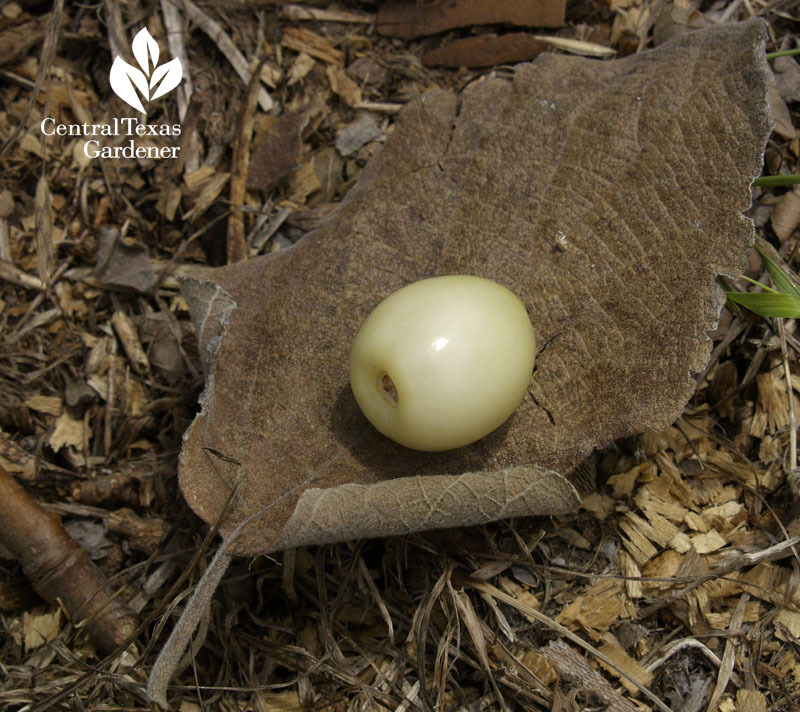 Small, edible fruits (that we can eat, too) will ripen in time to help out fruit-eating birds before winter. 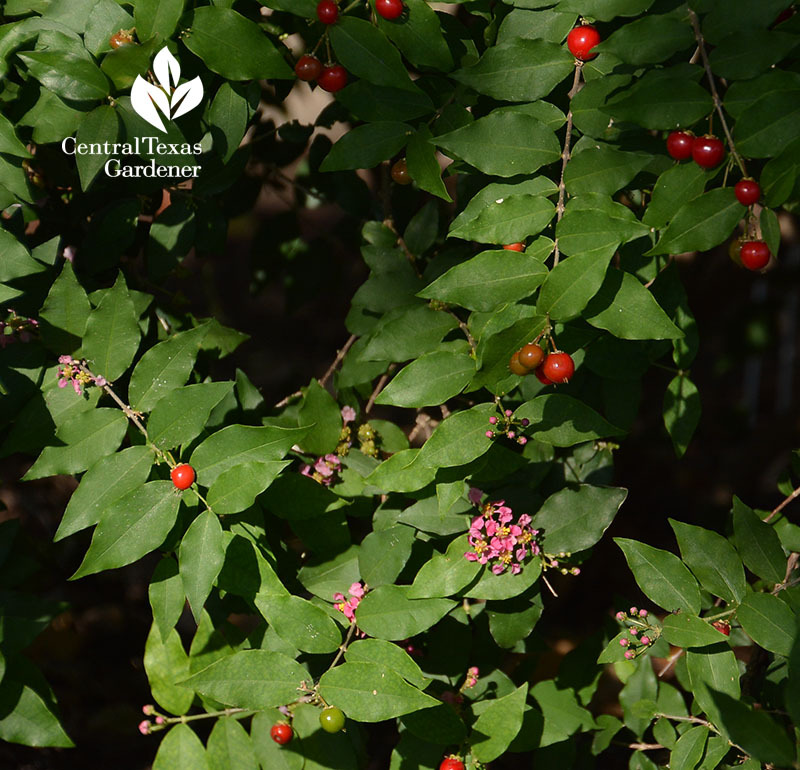 Growing shrubs and trees that flower seasonally is a surefire way to keep beneficial pollinators and birds around. 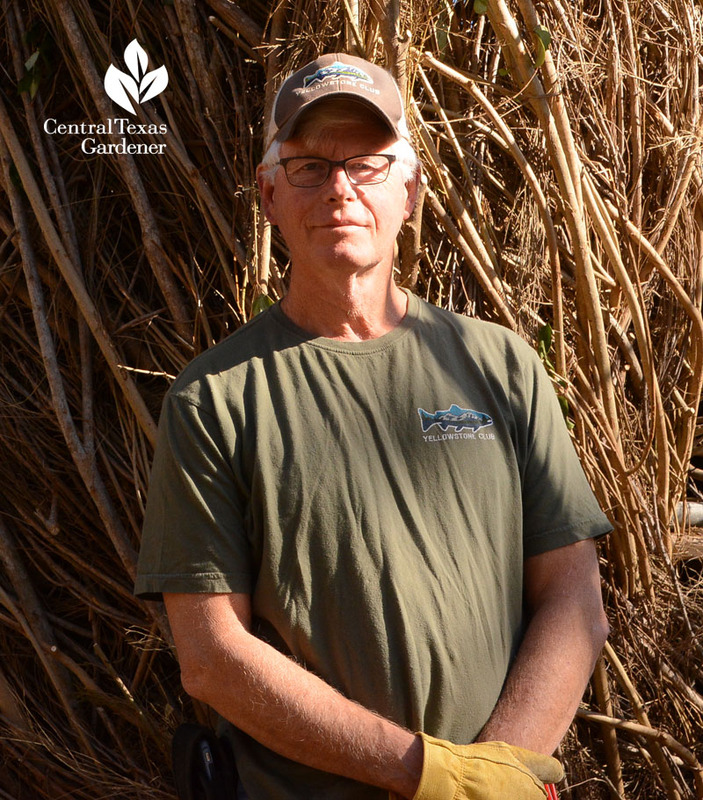 This week, Tim Kiphart, consulting horticulturist with wholesale Far South Nursery, has a few suggestions to plant in November. 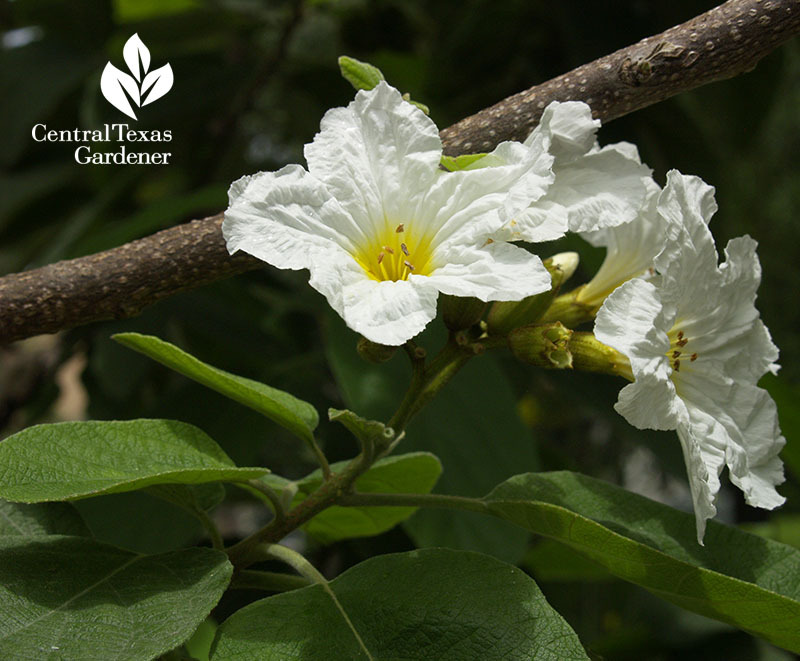 Mexican olive or Texas wild olive (Cordia boissieri) blossoms with clusters of ruffled white from spring to fall. 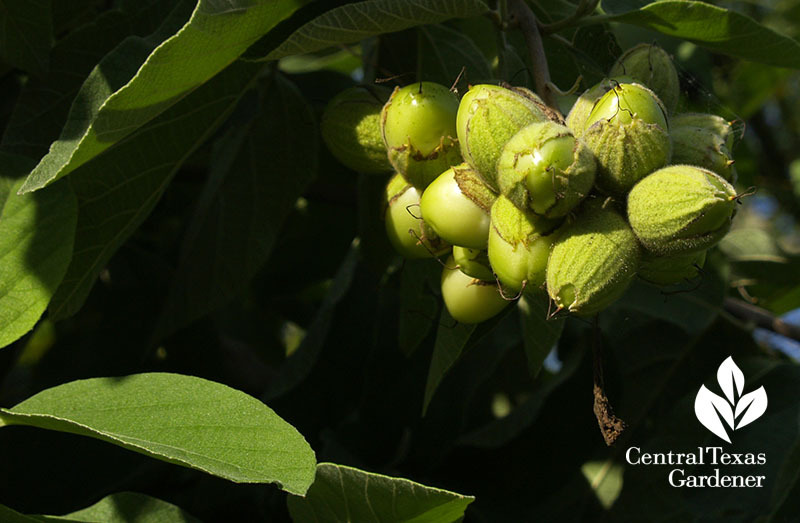 Birds like the fruits, which indeed look like olives when ripe. 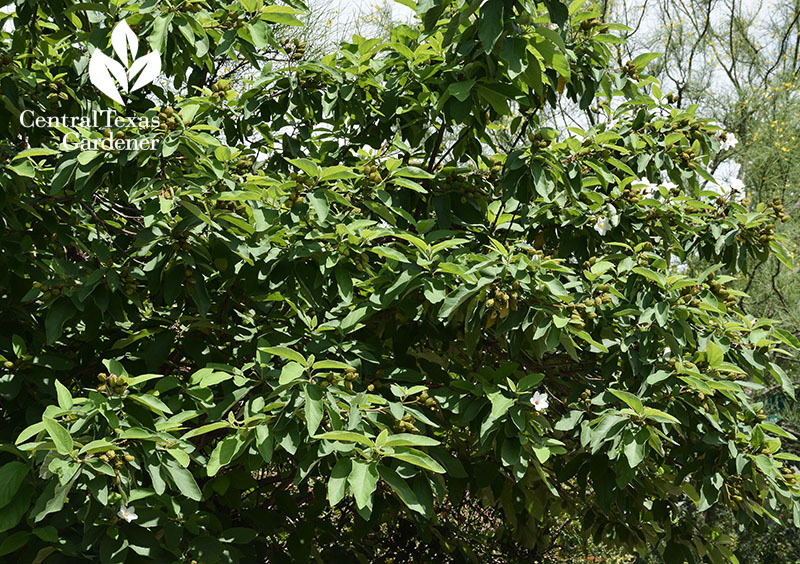 Growing 12-15’ tall, Mexican olive likes sunlight and well-drained soil. It may suffer damage in hard freezes. 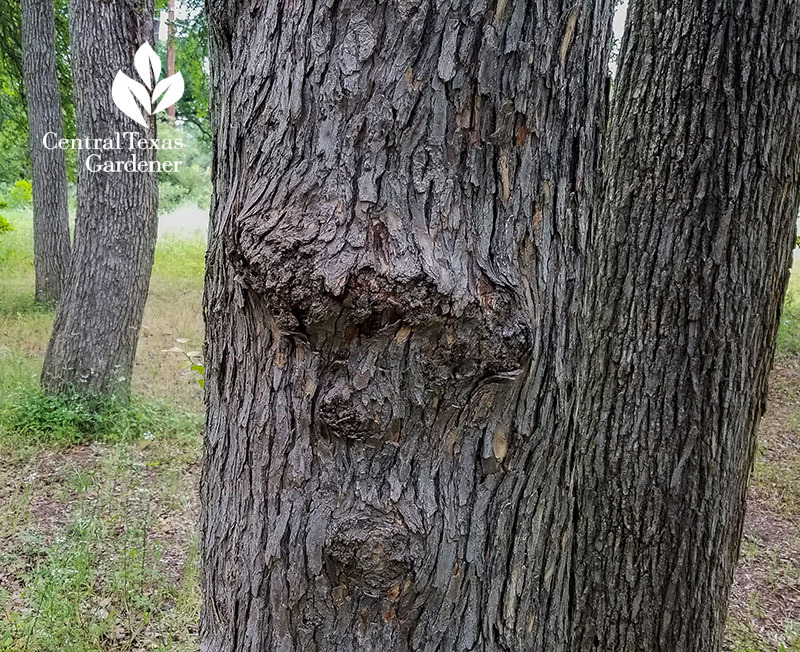 If not, it’s an evergreen screening shrubby tree. 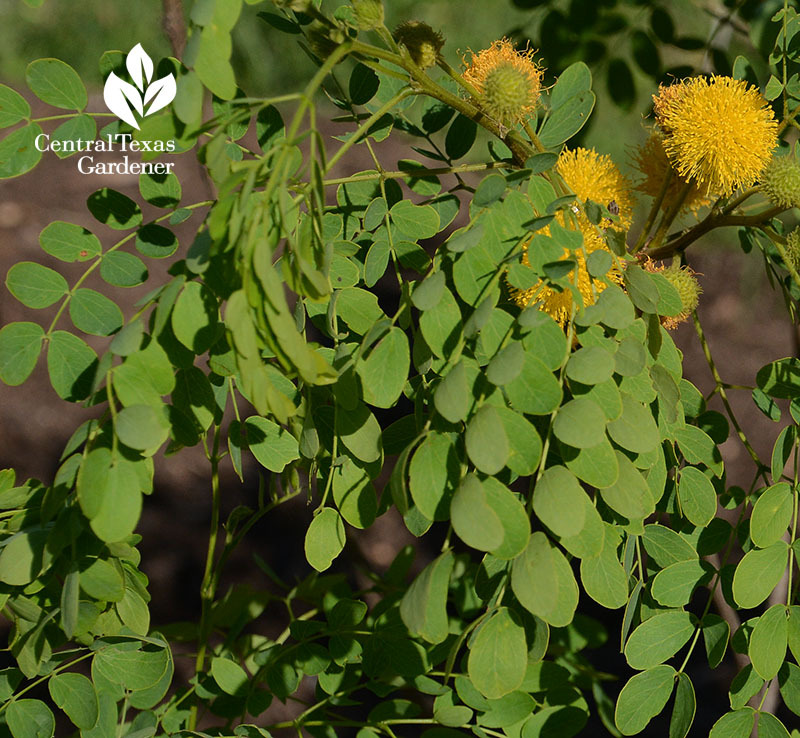 Native goldenball leadtree (Leucaena retusa) also flowers summer to fall. 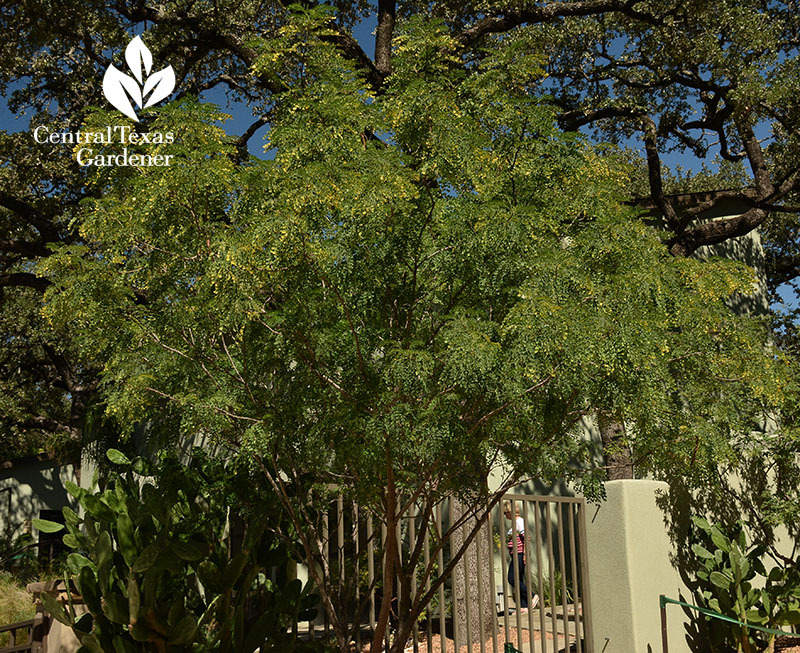 Growing 12- 25’ tall, its pea family leaves and airy habit lend light shade to protect succulents that want the same good drainage it requires. 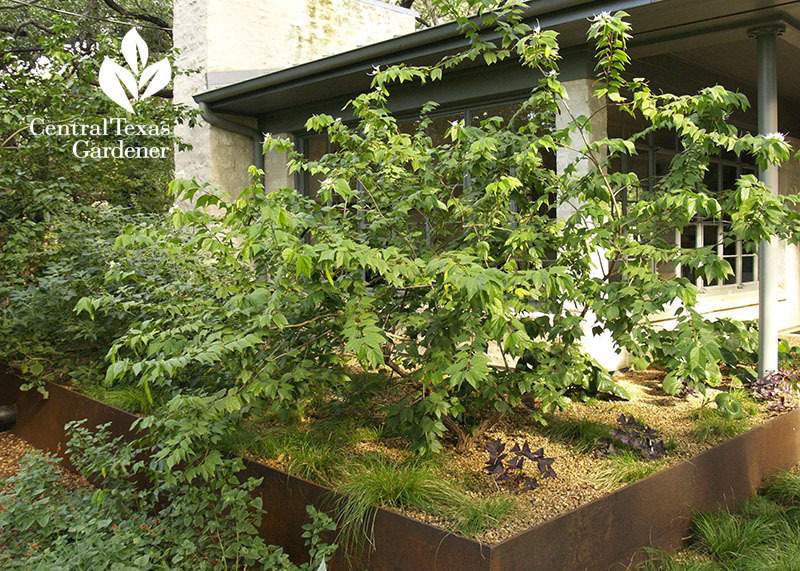 Give this multi-trunked deciduous tree room to spread. Deciduous Mexican bauhinia (Bauhinia mexicana) can take some shade. 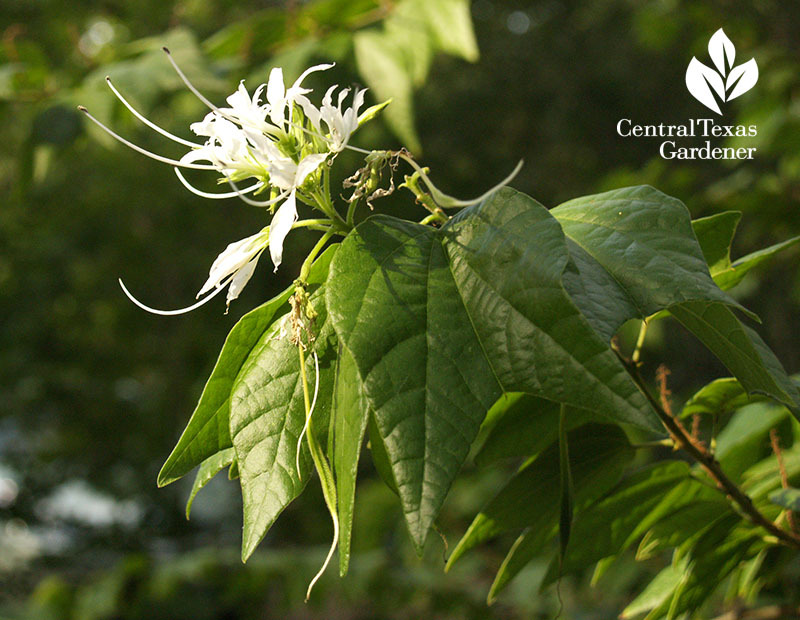 Growing 4-8’ tall, it blooms summer to fall, and again, prefers good drainage. 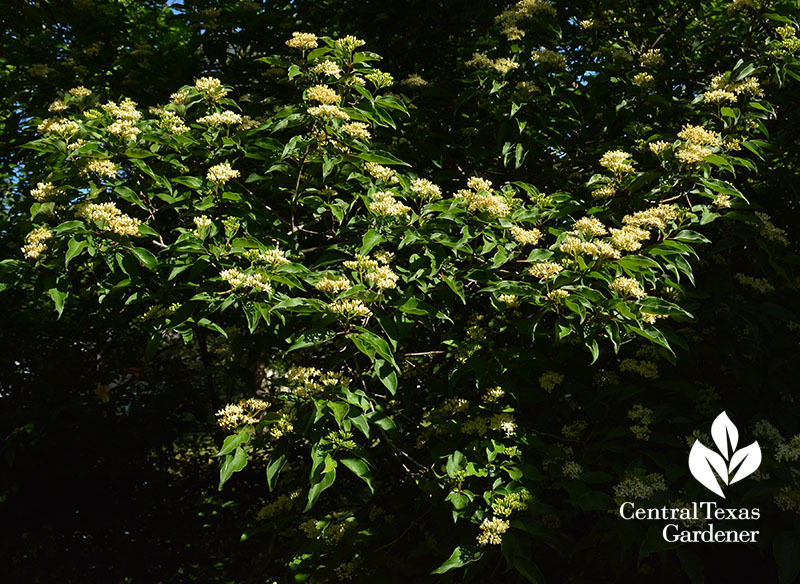 Native rusty blackhaw viburnum (Viburnum rufidulum) makes a great screening shrub/tree at 12 feet or taller. 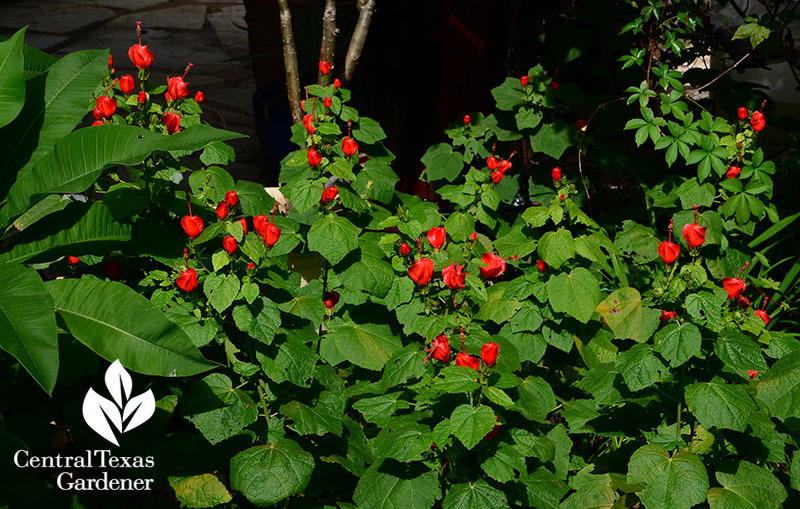 Flowering in late spring, it accepts part shade and various soils, including my east Austin heavier soil. 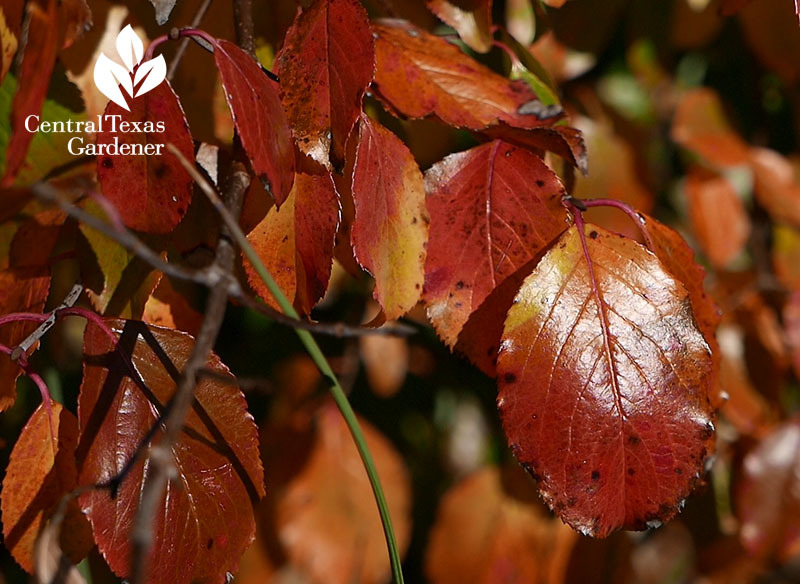 I’ve never gotten the great fall color, but others sure claim that glory. 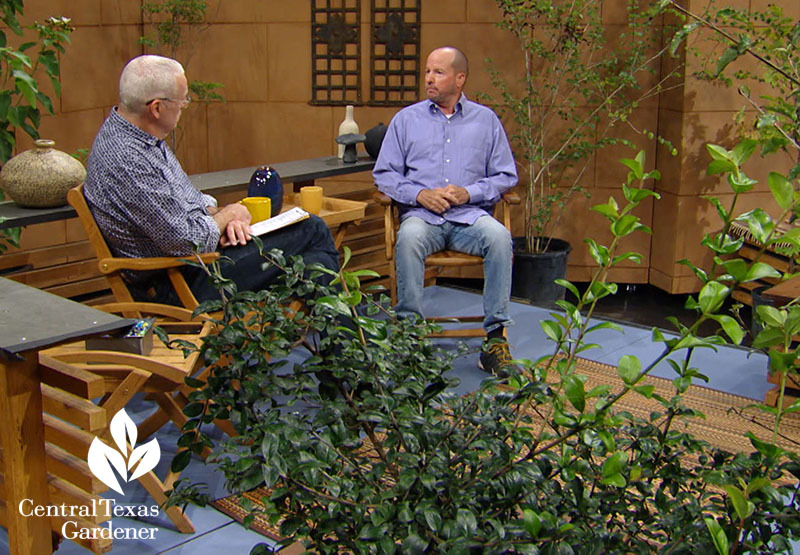 Note: once established, rusty blackhaw wants a team and it thickets! Tim’s the expert here, so watch now for more. 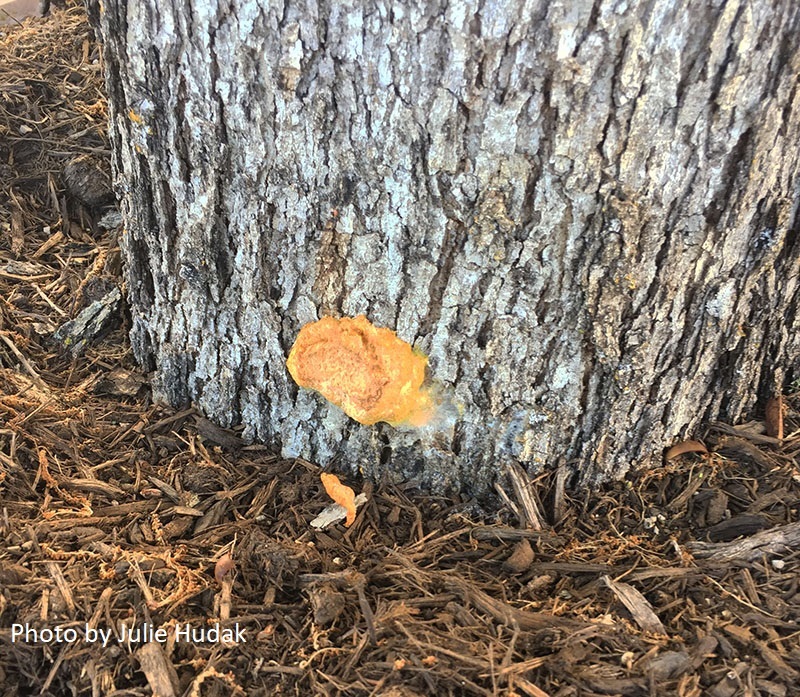 Julie Hudak’s oak tree has a yellow fungus-looking growth on her 10-year-old tree and near its base. 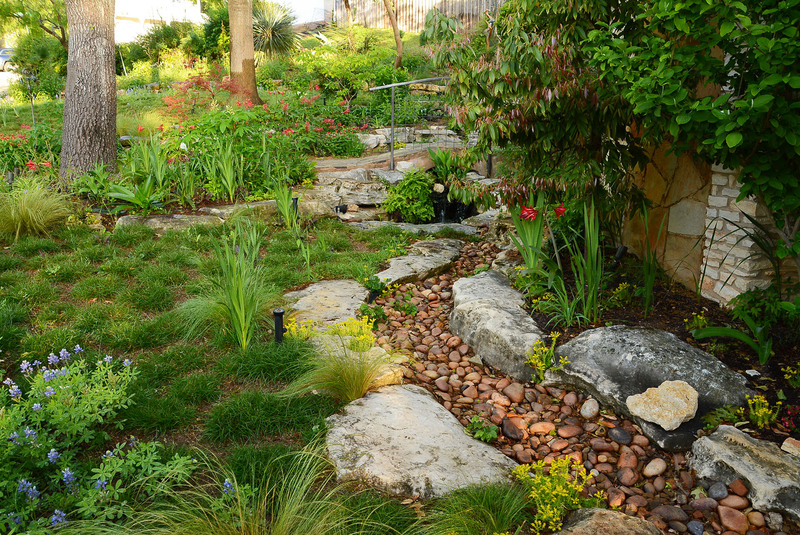 Previously she’s seen mushrooms growing out of the base where the mulch and the oak tree touch. Is this a problem? 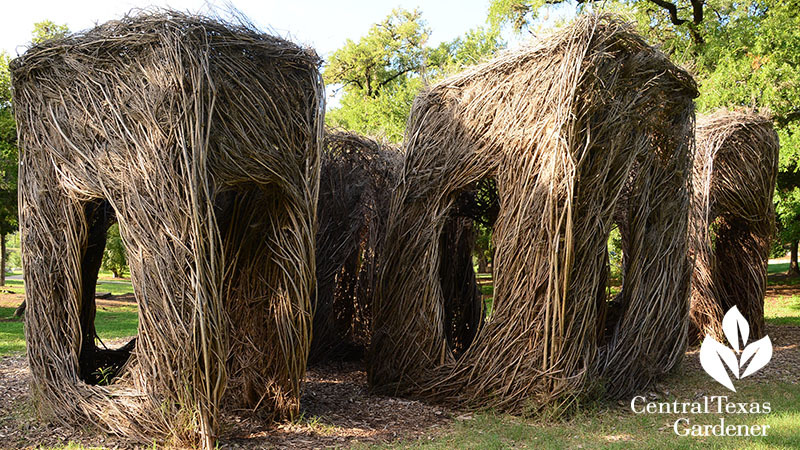 First, avoid mulching against tree trunks. Next, while many fungi and other microbes in the garden aren’t worrisome, unfortunately, this shelf fungus is. 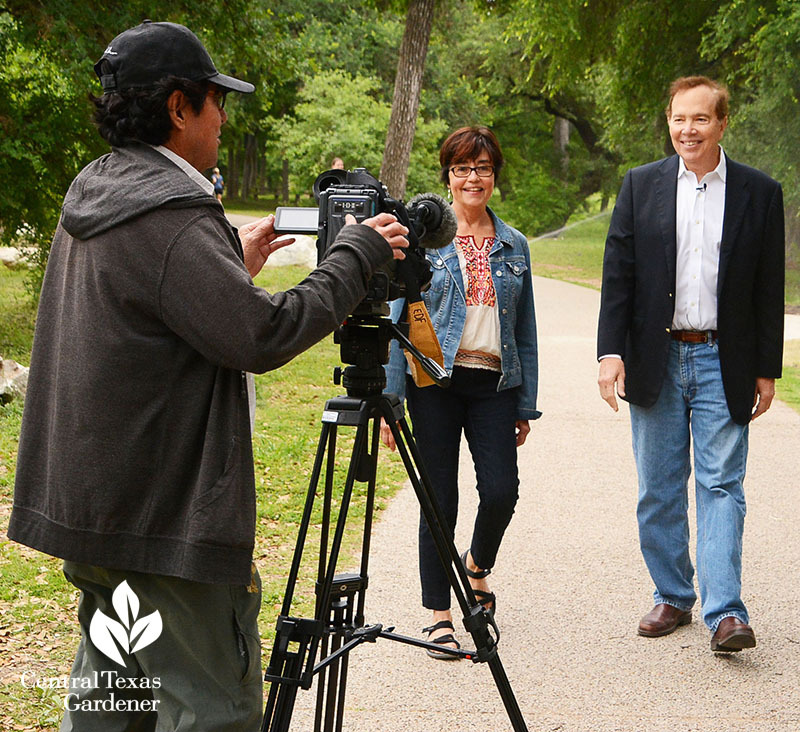 April Rose, Urban Forest Health Coordinator for the City of Austin, tells us: “There are fungi that are just normal leaf spots and no big deal, as well as fungal bodies that grow on dead tissue that is localized (like an old pruning wound) vs. spreading root rots like ganoderma, like shelf fungus.” Watch now for Daphne’s complete answer. On Tour: You well know how taking a walk in the park restores our equilibrium in habitats of concrete and computers. Photo by Ed Fuentes. But what if that essential peace is disturbed by compacted soil, drought, floods, and disc golf slams into already stressed trees? (Imagine getting hit by a flying object every day.) Photo by Mark Morrow. 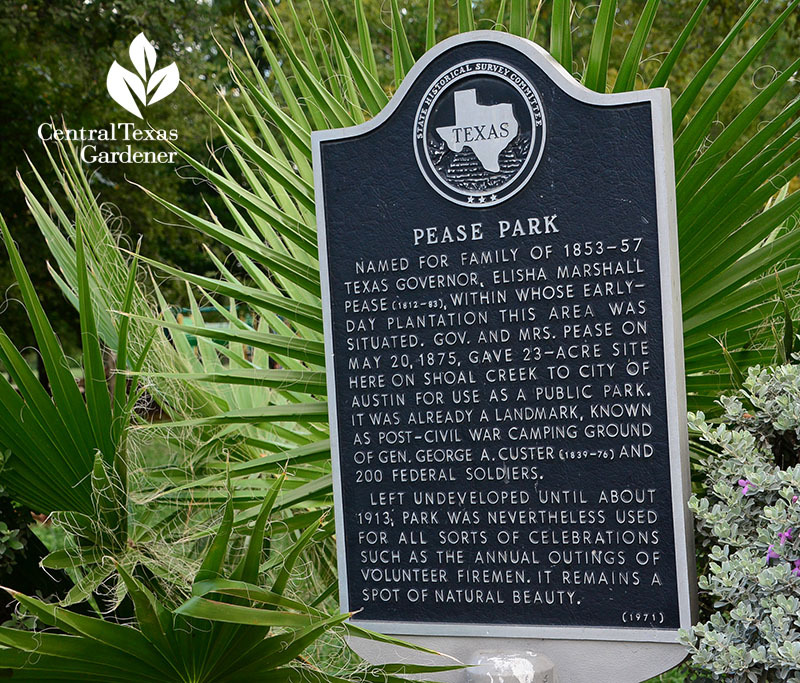 That’s what happened at historic Pease Park, established by Governor Elisha Marshall Pease and his wife. 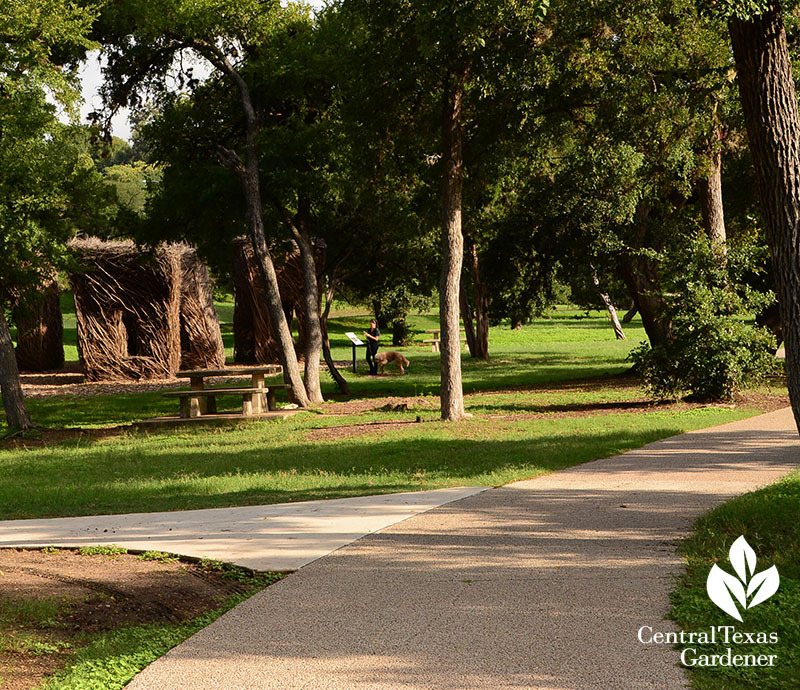 In 1875, they donated 23 acres of their land for a central park along the Shoal Creek Greenbelt. 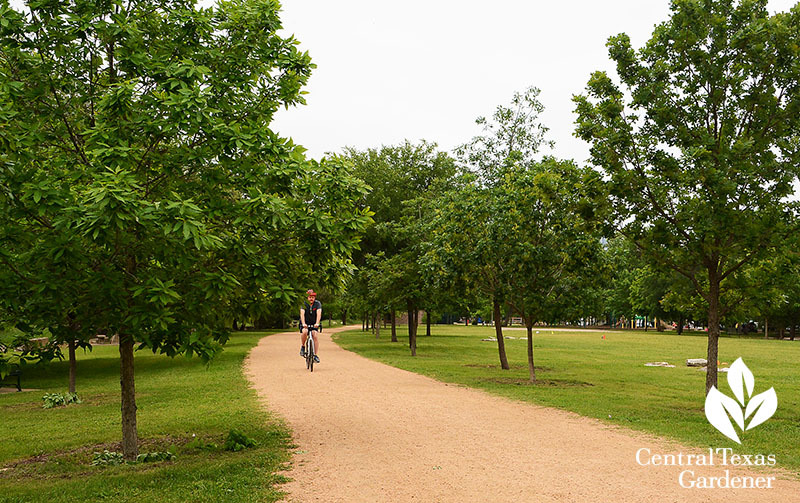 It’s grown to 88 acres along Lamar Boulevard. 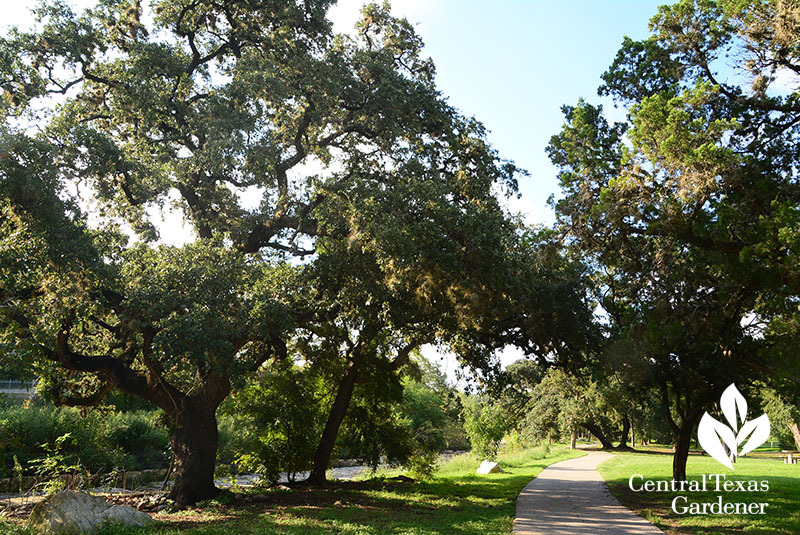 As a UT student, I often headed to Pease to unburden my scholarly and youthful troubles under kindly live oak trees. 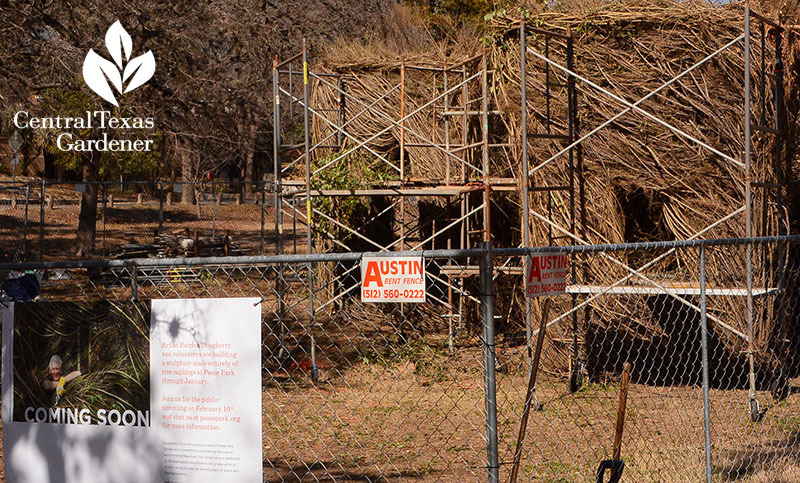 Those trees were in big trouble—as was the park’s reputation—when Pease lover Richard Craig reached out to Conservation Management Consultant Jill Nokes in 2008. 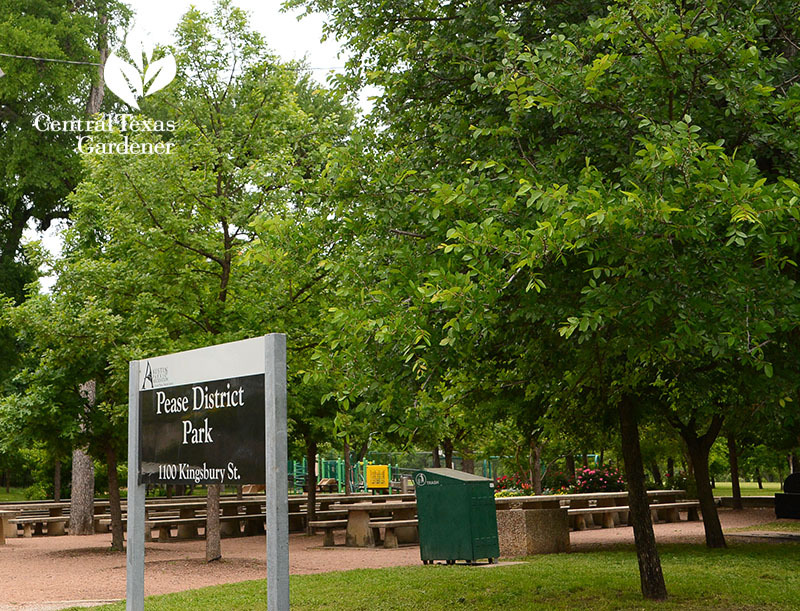 Working with the Austin Parks Foundation Adopt-a-Park program, he rallied community support and founded Trees for Pease. 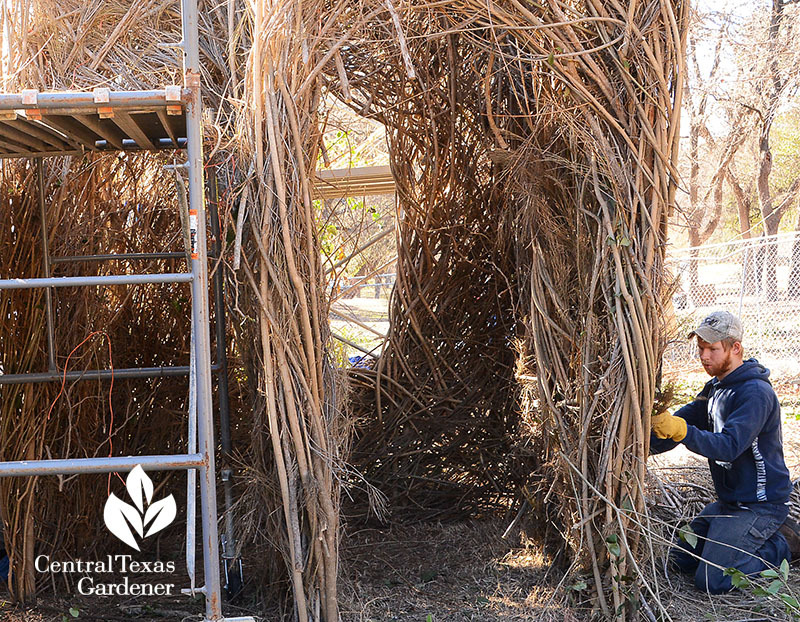 By 2013, it had grown into a full-fledged non-profit, the Pease Park Conservancy. 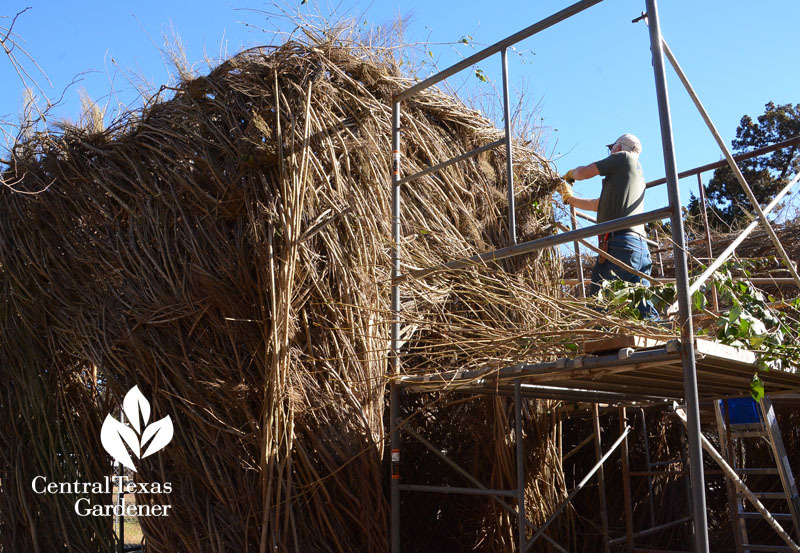 Volunteers have planted over 3000 trees, mulched trees and trails, and pruned or removed troubled trees. 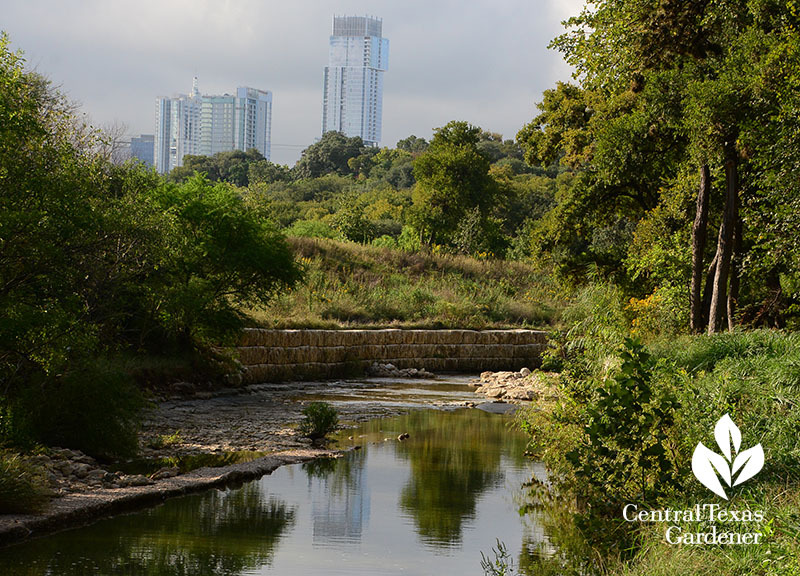 They’ve worked with the City of Austin to protect trees during flood control management, since Shoal Creek’s walk-across trickle quickly turns into dangerous surges in heavy rainfall. In south Pease, they upped family and group activity attraction. 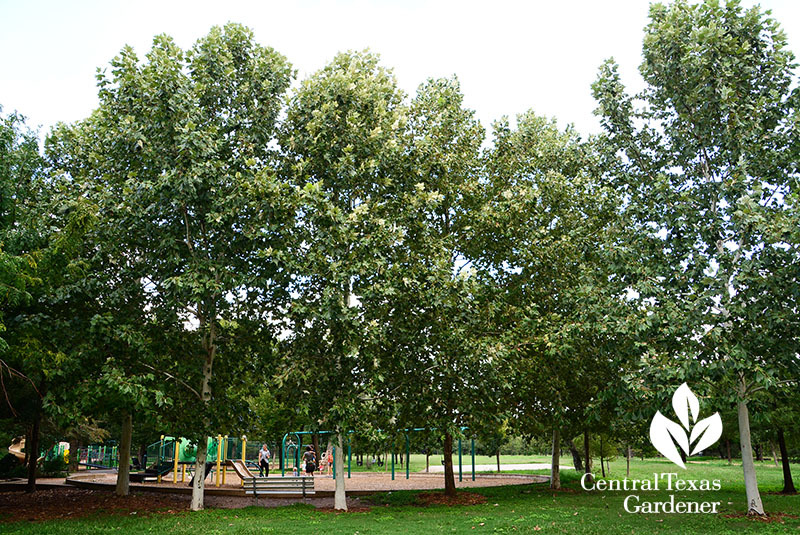 Grounds are more manicured and irrigated, inviting for picnics, energetic play and yoga. 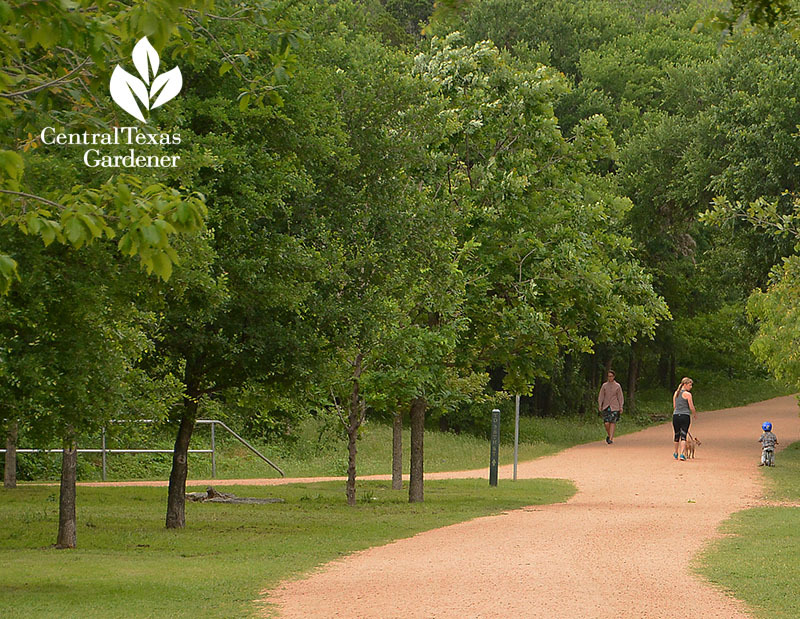 Since others prefer a communion with nature itself, paths intersect with less tended areas that leave tree snags and undisturbed cover for wildlife. Do note: dogs must be on leash south of the 24th Street bridge. Head north of the bridge for pup games. 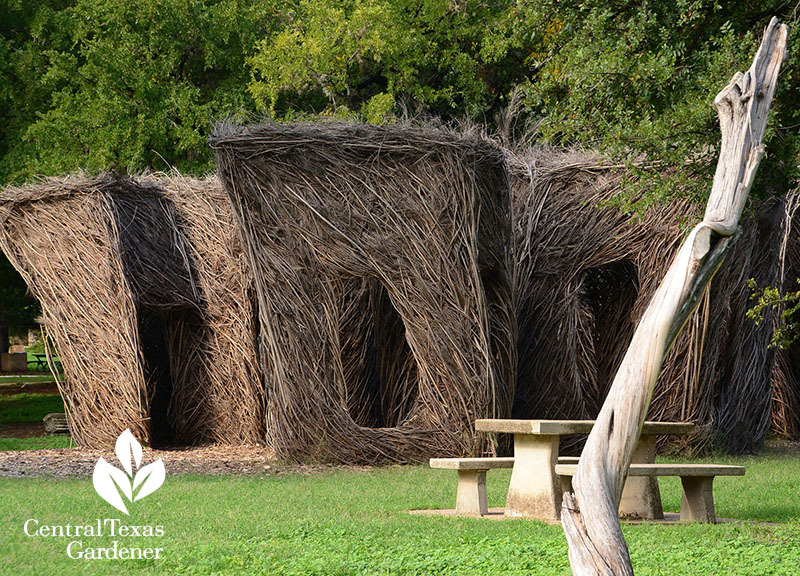 To celebrate its 10th anniversary in 2018, the Pease Park Conservancy raised funds, including from the City of Austin’s Art In Public Places to bring in North Carolina’s Stickwork sculptor Patrick Dougherty. 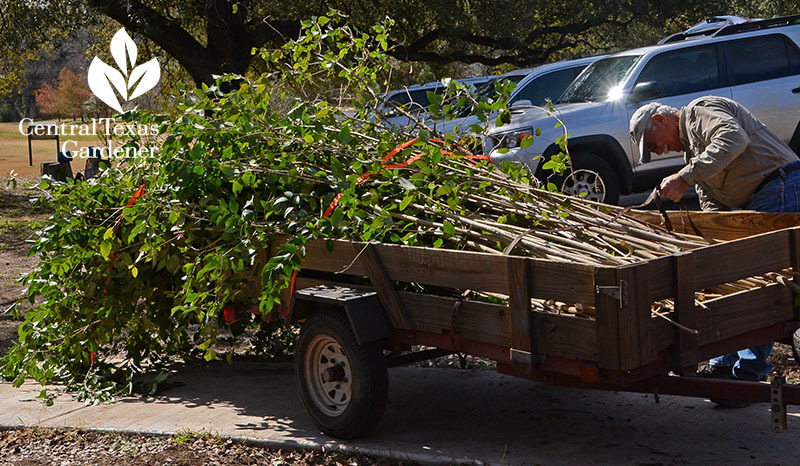 Austin Tree Experts donated their services to help cut and haul trailer-loads of branches cut from invasive plants, including ligustrum and Roosevelt weed. 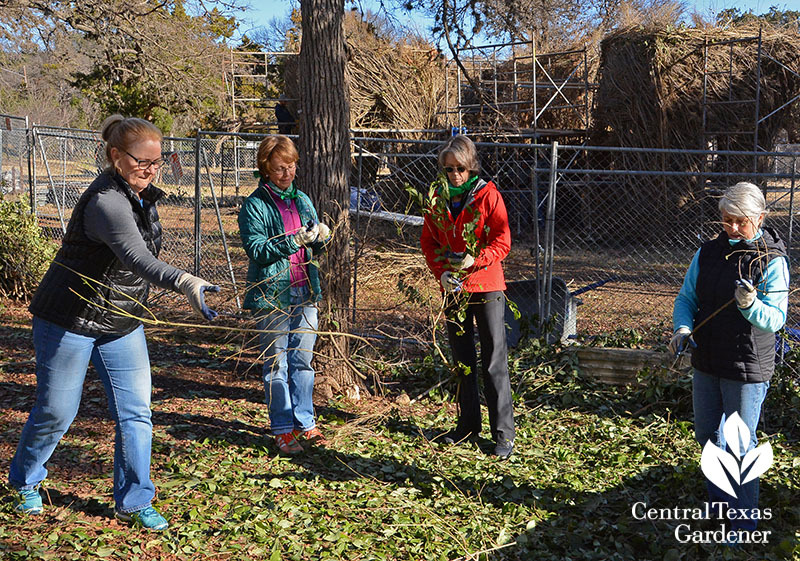 Conservancy board members and volunteers stripped leaves and helped weave. 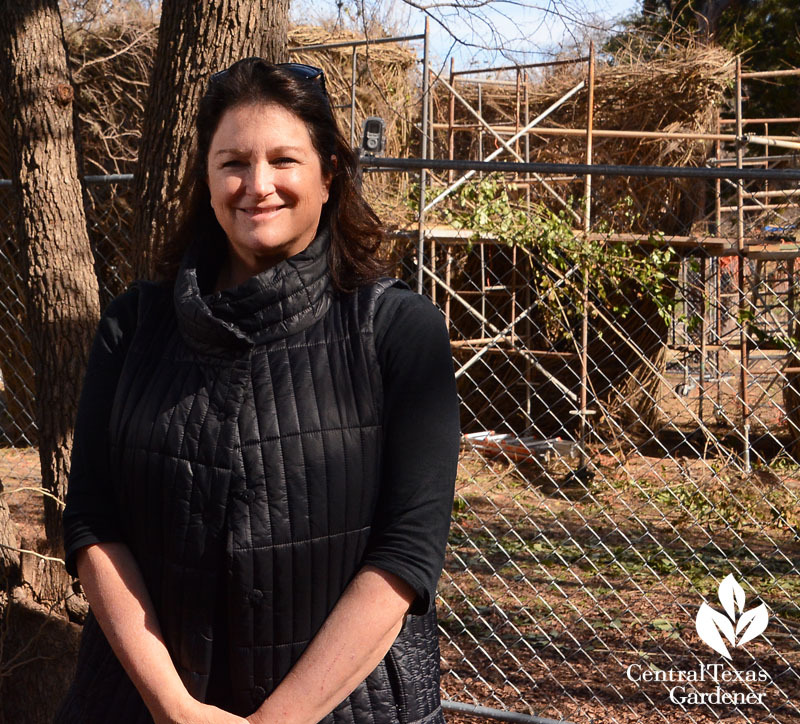 In a few years, Yippee Ki Yay will return to the earth as mulch, but Pease Park will live on, thanks to Pease Park Conservancy’s perpetual engine of volunteers, supporters, and community events. 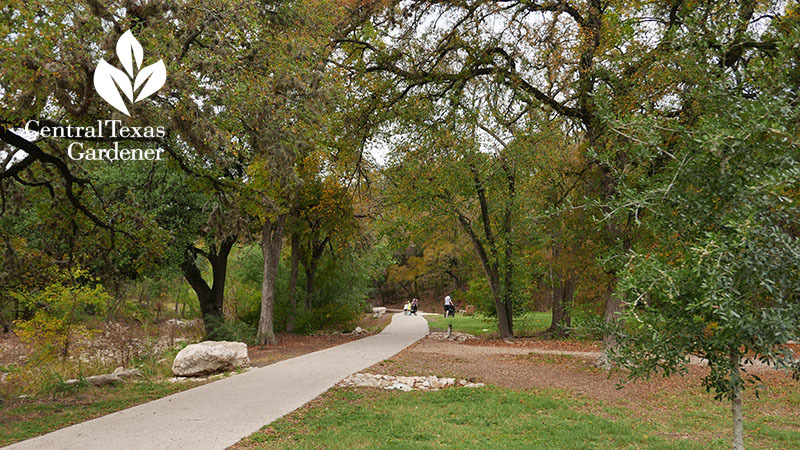 Richard Craig notes that Austin’s Urban Forestry Grant program was instrumental in saving Pease Park, so check them out for stewardship resources to preserve your neighborhood walk in the park.